Note: As of ArcGIS 10.2, Esri no longer ships the libraries needed for SDE30. FME does not formally support SDE30 beyond ArcGIS 10.2. However, some users have found using ArcGIS Pro libraries is still successful. As Esri no longer officially supports the libraries, we cannot guarantee the results of this workaround. The "Esri ArcSDE" format is unavailable because it has unmet dependencies. and contact <a href="http://fme.ly/8q8">http://fme.ly/8q8</a> if the problem persists. This issue may be caused when the SDE SDK has not been installed or is not available on the client machine. This can be an issue if you have ArcGIS Desktop installed on the same machine as a 64 bit FME. ArcGIS Desktop is a 32 bit program and has 32 bit libraries with the same names as the required 64 bit libraries. When FME is attempting to find the .dlls that it needs, it first searches the directory defined via the ArcGISHOME or AGSDESKTOPJAVA environment variables. However this will be pointing to the 32 bit location. Then it searches the directory defined via the SDEHOME environment variable and finally the FME Install directory that occurs first in the PATH environment variable. 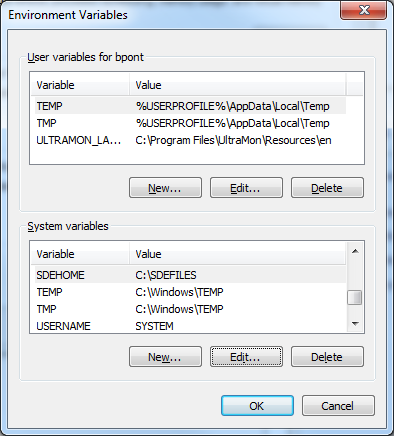 The same issue arises if you have a 32 bit FME installed and no ArcGIS Desktop product. The required libraries are not available and FME cannot load them. To correct this issue the SDE libraries must be installed correctly. You can get the libraries from your ArcSDE install. and two direct connect libraries related to the database client that you are using. e.g. gsrvrora11g100.dll and sdeora10gsrvr100.dll for an Oracle 11g client. Option 1) Install the full ArcSDE SDK and check that an SDEHOME environment variable is set - pointing to the folder that contains the ArcSDE bin folder. Option 2) Put these 64 bit .dlls in the bin folder of the SDEHOME directory - SDEHOME should point to the folder containing the ArcSDE bin folder. 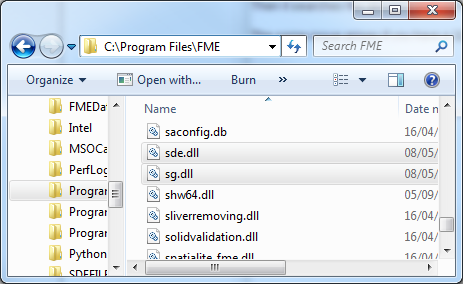 Option 4) Put these 64-bit .dlls directly in the FME_HOME folder - and check that this installation directory is the first one referenced in the PATH variable - this is the least recommended solution as a new FME installation may remove these files. Option 1) Install ArcGIS for Desktop. Option 2) Install ArcGIS Explorer. Set LD_LIBRARY_PATH to point to the location of these .so files. As with Windows, if you are using a 2 tier (Direct Connection) to connect to your ArcSDE database you will also need the additional direct connect libraries for the database that you are accessing. These need to be put into the same location.